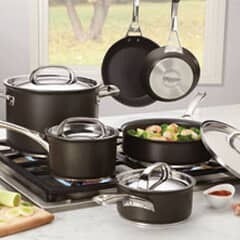 Circulon are leaders in the manufacture of affordable, non-stick hard-anodized aluminium pans, cookware, and bakeware. 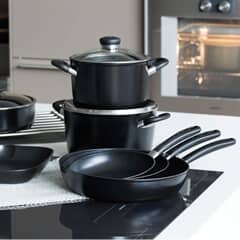 They were the first to combine hard-anodized aluminium with a non-stick system and were the first manufacturers to offer a non-stick guarantee. Today, they offer a lifetime satisfaction guarantee, and Circulon pans, like the Circulon Genesis, are among some of the most popular that we sell. Welcome to our brand new Circulon Ultimum forged high density cookware range, where we promise food will not stick.... guaranteed! 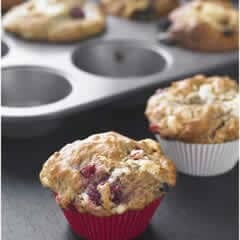 Welcome to our brand new Circulon Ultimum bakeware range, where we promise food will not stick.... guaranteed! 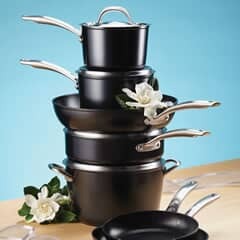 Welcome to the Momentum hard anodized cookware range, where your food will not stick...guaranteed! 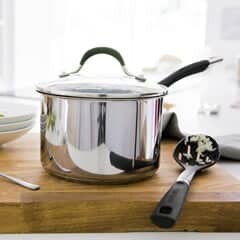 Welcome to the Momentum stainless steel cookware range, where your food will not stick...guaranteed! Hard anodised aluminium is preferred for its strength, and is used in a lot of professional cookware. The anodising process means that it has a non-toxic non-stick surface. This means that Circulon pans and Circulon cookware items are easy to clean as well as being hard-wearing and durable. Although hard-anodised aluminium is more expensive than conventional non-stick materials, it lasts longer and is better quality. 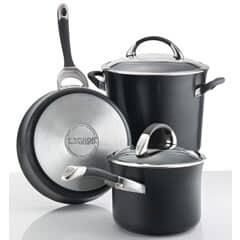 ECookShop is the official kitchenware website of Dawsons Department Store. 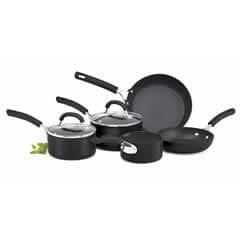 You can find a vast range of non-stick pans, hard anodised cookware, and Circulon pan sets. We offer competitive prices, even on the latest ranges, and if you spend more than �50 on any order, you can also benefit from free delivery to any UK address. Browse our kitchen range, call and speak to a member of staff if you want to ask any specific questions. 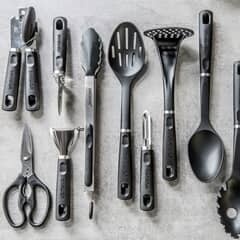 Alternatively, you can call in to the store to take a look at everything we have on offer, or use our secure online ordering system to buy pans and other kitchenware items and accessories. For more than 30 years, Circulon pans have offered a convenient, mess free means of cooking. Items from the Circulon frying pan to the Circulon wok have proven popular with amateur cooks and professional chefs alike. They will offer a lifetime of stress free use with some regular and easy maintenance. 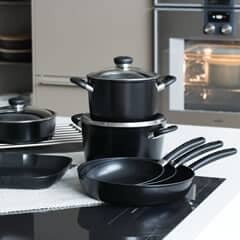 Buying pan sets means that you can buy the saucepans, frying pans, woks, and other pans and accessories that you need in one go. 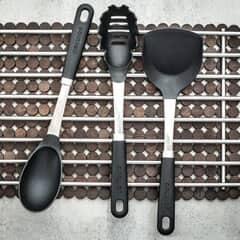 This means that the set will match, you can enjoy high quality pans of all types and sizes, and you can also save money when compared to buy the pans individually. Although Circulon are best known for their manufacture of high quality pans, Circulon bakeware is also a popular line. 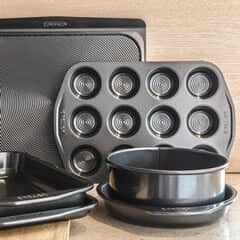 It uses the same durable and hardwearing material, includes items like cake tins, Yorkshire pudding tins, and loaf tins. The bakeware has the same non-stick properties as Circulon pans and means that you can stock your kitchen with affordable bakeware items. Are Circulon Pans Suitable For Induction Hobs? There are many benefits to owning a Circulon pan set. However, there are some pitfalls too. Most Circulon saucepans and frying pans are not suitable for use on induction hobs. Induction hobs work by transmitting energy from the cooker directly to the pan. The pan must be made of a ferrous material, otherwise the energy cannot be transferred to the material. The hard-anodised aluminium used in the manufacture, by Circulon, is not naturally suitable for use on induction hobs. However, some ranges like the Circulon Symmetry range are designed with induction heating in mind so can be used for this purpose. To enjoy a long life of trouble free and non-stick use, you do need to properly maintain the pans and bakeware. This means cleaning them properly and using appropriate cleaning products. Because Circulon cookware is non-stick, it is easier to clean with less chance of food becoming stuck and burned on the bottom of the pan. Different lines and ranges do have different properties but, generally, the following maintenance is required with your new pans. Dishwasher - How to clean Circulon pans; The Circulon Infinite, Premier Professional, Steel Elite, and Aluminium ranges are dishwasher safe. However, Circulon recommend that you hand clean all their pans and bakeware in order to maintain the integrity and quality of the items. Dishwashers use strong detergents, which can break down the non-stick coating of the pans, if they have not been treated or manufactured to be dishwasher safe. Oven Safe - All Circulon pan sets are oven safe, but different ranges are safe at different temperatures. You should check the user guide that comes with your pan set, and avoid using any pans at higher temperatures than stated. How To Condition Circulon Pans - If you don't take good care of your non-stick pans, they will eventually stick. Clean them according to their usage guidelines. 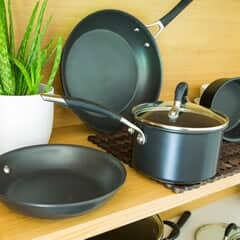 Seasoning a pan not only improves the flavour of the food you cook but also prevents food from sticking. If you burn food on the pan, you can boil a mixture of water and white vinegar to help recover the non-stick properties. What Is The Circulon Cookware Coating? Circulon is made using DuPont's Autograph coating. DuPont are the same company that manufacture Teflon, so they have non-stick pedigree and experience. Circulon use a unique TOTAL Food Release system. It has high and low textured rings, which reduces surface tension and helps further reduce the possibility of food sticking to the pan surface. Some Circulon pans also have the same non-stick material around the outside of the pans to help prevent burning and chipping. What Are Circulon Pans Made Of? Circulon cookware is made from anodised aluminium. The material is strong and it conducts heat, which means that food is heated quickly and heat applied uniformly. The anodised aluminium is then coated with a non-stick DuPont coating. This coating means that it is easier to cook food without it sticking, makes cleaning the pans easier, and is one of the reasons for the popularity of Circulon products. ECookShop is the official website of Dawsons Department Store. We stock a large range and selection of cookware, kitchenware, and bakeware. Enjoy competitive prices and, if you spend more than �50 on your order you also enjoy free delivery to your UK address. Order online, in store, or give us a call to speak to one of the team and ask any questions you have.